2016 was hard. It tested our patience and forced us to practice a f**kton of compassion (a completely valid unit of measurement). We saw plenty of loss, pain, violence, and fear, but we also saw moments of triumph, love, and progress. As the year comes to an end, we wanted to take a moment of reflection on the good and the bad. We should not ignore the uncomfortable moments that anger or embarrass us; we should use them as fuel to do better next year. We should also not downplay moments of growth in favor of wallowing in self pity. Life is about balance, right? Hopefully these reflections also motivate you to think of some moments in your own life this year to grow and learn from. Let’s move into 2017 stronger, smarter, and filled with hope. The 2016 United States presidential election turned the entire world into nervous, neurotic wrecks. Seriously… no one was safe from the hate, slander, and fear that the election season kindled. Regardless of the candidate you supported, harsh words and accusations were thrown from both sides. We were a nation divided. We may not have all “come together as one united people” quite yet, as our new President Elect suggested in his acceptance speech, but we as people have united in certain ways. Citizens from both side of the polarizing election have begun to open up their feelings on the matter and provide support for one another. People who usually remain quiet on political matters have raised their voices to be heard. People paid attention to this election, and are doing their part to protect the policies they care about most. Use this election as motivation to keep yourself educated, informed, passionate, and hopefully, open to listening to opinions from all sides. Zika scares, political instability, drug scandals, the fabricated stories of US swimmers, and violent acts against attendees made for a summer games with negative headlines. More than 11,000 athletes from 205 nations came together to display new levels of human ability, but at times, it was their emotional abilities that shone above athletic ones. A Refugee Olympic Team competed for the first time. Chinese swimmer Fu Yuanhui won over the hearts of viewers with her enthusiasm realizing she won and her candor talking about her menstrual cycle. 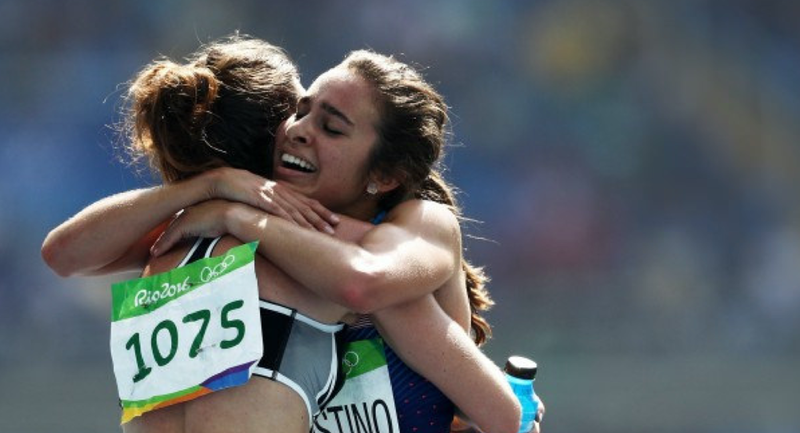 New Zealand runner Nikki Hamblin and American Abbey D'Agostino fell in the women's 5,000-meter heat. D'Agostino helped Hamblin up, and they encouraged each other to keep going. These were just a few of the heartwarming moments that helped overpower the bad. A president has taken office who openly denies human-caused climate change. Scott Pruitt, Trump’s pick for EPA administrator is suing the agency over the Clean Power Plan. Rick Perry the new Secretary of Energy campaigned in 2012 with promised to close the Department of Energy altogether. Trump also chose Rex Tillerson for Secretary of State, the CEO of ExxonMobil. In May, all of Portugal’s electric usage was provided by renewable resources for four consecutive days, further proving the importance of investing in solar, wind, and other renewable technologies. Science tells us that that the sun is sending enough raw energy to earth daily to power or planet’s energy needs for a full year, and countries like Sweden, Scotland, and Germany are leading the way with huge strides towards diminishing energy use. Cost for renewable energy is dropping worldwide as these trends continue to grow. Next up? More cities and companies going green, new hybrid and fuel efficient cars are coming out, and sustainable products becoming more cost efficient. The Standing Rock Sioux Tribe fought the construction of a crude-oil pipeline that would pass under ancestral lands. Peaceful protests were met with attack dogs, fire hoses in sub-freezing temperatures, grenades, rubber bullets, and other tactics resulting in severe injuries. On December 4th, the U.S. Army Corps of Engineers announced it would not allow the Dakota Access Pipeline to cross under Lake Oahe, stating alternate routes would be considered. This was a huge victory for the indigenous people, their allies, and the environment they were fighting to protect. While the fight to eliminate the pipeline is not over, this standing rock victory was something to celebrate.